It’s a rocker. It’s a push toy. It’s a ride on. You get three toys in one with this heirloom delight. 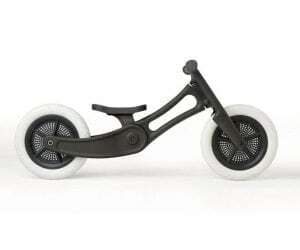 The Wishbone Mini-Flip is a smaller, lower and more stable version of the Flip. Available in Red, White, Pink and Aqua colours. It’s a rocker. It’s a push-toy. It’s a ride-on. With the Wishbone Mini Flip you get three toys in one! The Wishbone Mini Flip is a smaller, lower and more stable version of the Wishbone Flip. 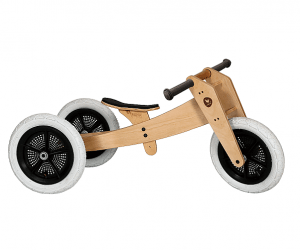 Perfect if your little one is quite petite or not so confident on their feet! 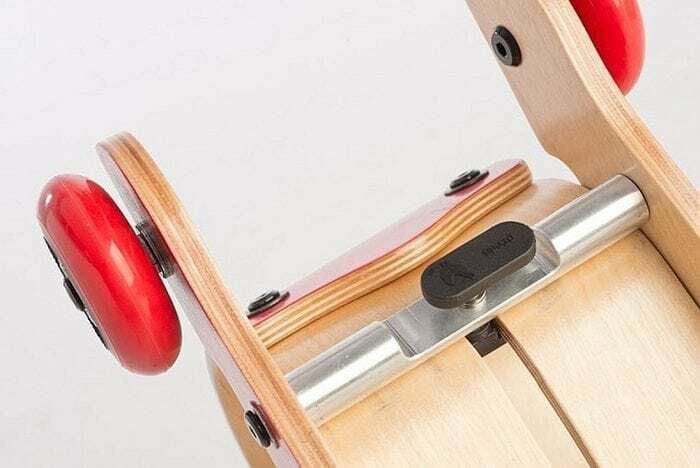 With its clever flipping mechanism, the Wishbone Mini Flip transforms from a rocker to push toy and ride-on in seconds just like the Wishbone Flip. Take a look at the video below to see how simply it is! 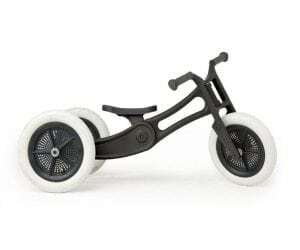 Fully assembled in minutes, with scooter wheels that only allow forward and reverse motion. It comes with handy bar protectors so your paint stays on the walls while cruising round the house. 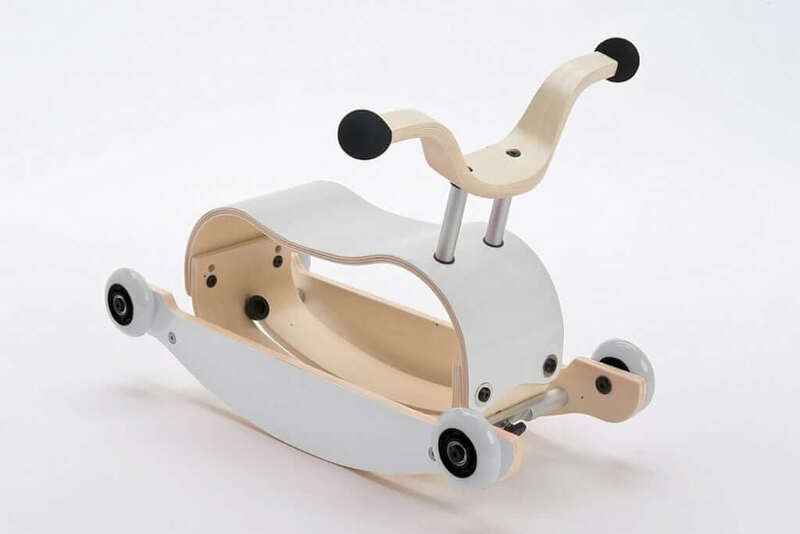 Two different height positions for the top to extend its use as your child grows. Comes in Red, White, Pink and Aqua colours. 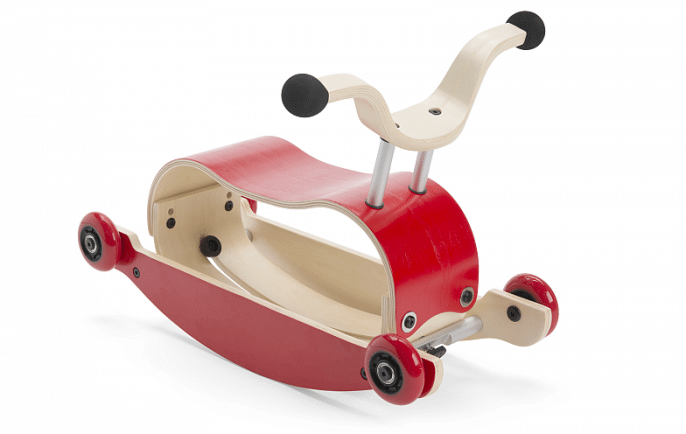 Rocker toys are great at building up core strength and help to develop postural control. Allows practice of body adjustment to movement which is important for overall mobility and stimulates the vestibular system. 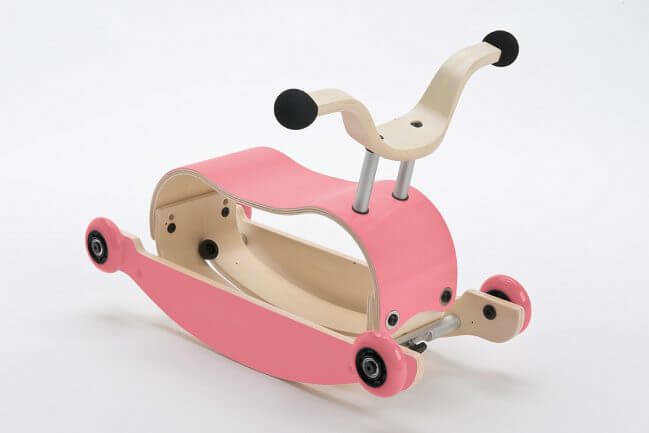 As a push toy, arm, leg and grip strength is developed. 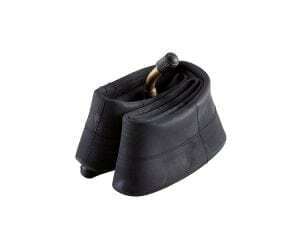 Provides support for those kids who are a little unstable on their feet as emergent walkers. 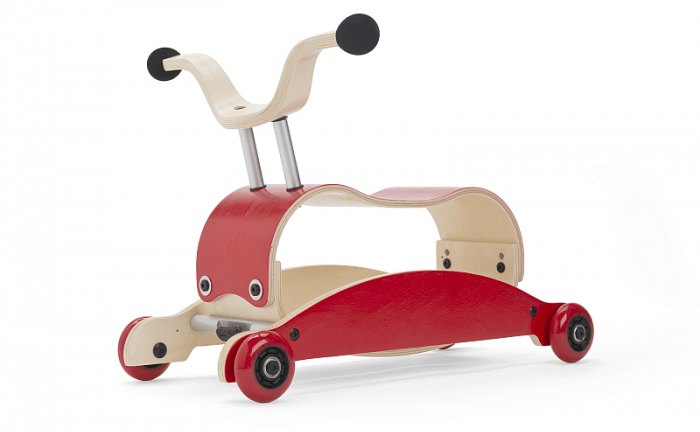 As a ride-on, leg strength is improved as well as building up co-ordination of both sides of the body. 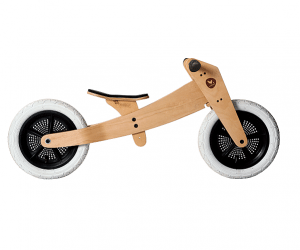 Not to mention endurance with all that scooting around! Read on to find out what you can do to boost your child’s brain development. Age Range | 9 months to 3 years. 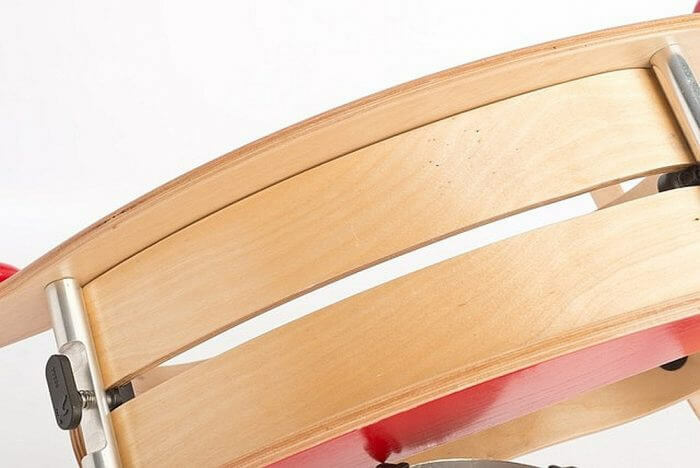 Made From | Plantation poplar, aluminium and steel. 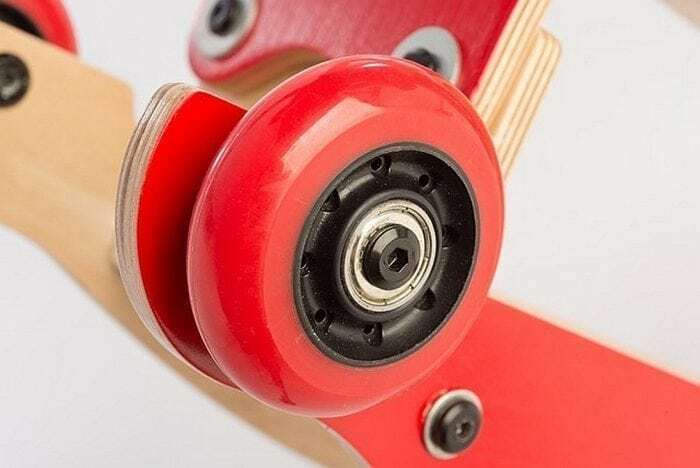 Wheels | 71.5 mm PU skate wheels + 608 steel bearings. Assembly| Assemble Wheels, Base, Top and Handlebars. See Assembly Videos for help. Certification | CE Mark. 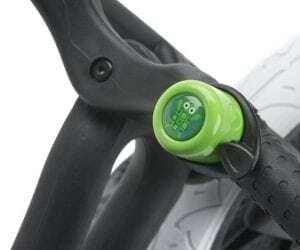 EU, US, Australian & NZ toy safety standards. Warranty | 1 Year. 100% repairable. *FREE DELIVERY only on individual products greater than £50. Standard Delivery to Mainland UK | 2 working days by Yodel Direct for larger items or Royal Mail for smaller packages. Express Delivery to Mainland UK | 24 Hours (available for some items). We got our daughter the Wishbone mini flip for Christmas and couldn’t be more pleased with it. She’s 14 months but small for her age and although she can’t yet use it by herself she’s quickly getting used to, and clearly enjoys, sitting on it while we rock her. I’ve seen a huge improvement in her ability to balance on it already and look forward to watching her develop to rocking, riding and eventually pushing it herself. It’s very well made and lovely quality, I particularly like the fact it’s not plastic like so many children’s toys. I can’t fault the service we received from prior to ordering through to home delivery.